I just adore holdover ads like this. They so reflect the joy of success at exhibiting. You've got a hit --- crow it out! Human impulse is always to go and look at what everyone else is looking at. Why be the wallflower who hasn't seen Boom Town? "Oh Boy!" says the Wilkes-Barre crowd with a rope around an all-star cast. This could be seen coming. The Comerford knew way ahead that Boom Town would be held over --- and over. MGM set terms on that assumption, and they were high. 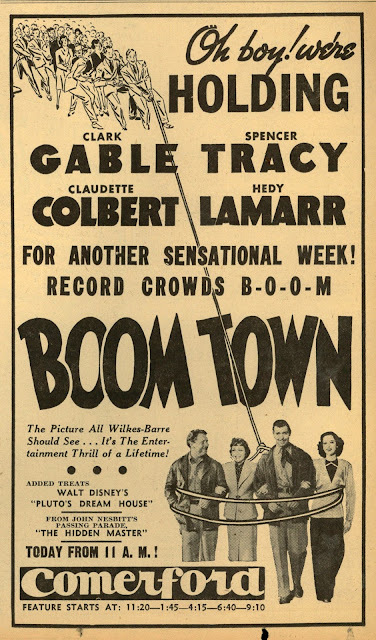 Boom Town was notorious that year for what Leo demanded. Well, take Gable, Tracy, Colbert, and Lamarr or leave them, said the Lion. Boom Town theme was close to distribution philosophy, being of corporate meat-eaters on never-ending prowl for profits. Who says movies were the voice of directors? This one was shout of parent company Leow's Inc. Their rope was around all of showgoers in lush year that was 1940. The Comerford Theater to which the happy crowd is flocking was located in Wilkes Barre, Pennsylvania, one of 88 theaters in Pennsylvania and New York run by Comerford Amusement Company. This organization had been sold to Paramount in 1930 by its owner, Michael E. Comerford, but when Paramount declared bankruptcy in 1933, Comerford returned to help run the theaters. The Comerford Theater opened in 1938 and was in the Art Deco-Moderne style, with exterior facings of terra cotta tile and green marble, a foyer paneled in walnut, an auditorium and loge finished in walnut and translucent marble panels, and ornamental plasters and bronze throughout. The crowd would have enjoyed these luxurious accommodations in air conditioned comfort. The partnership between Comerford and Paramount was dissolved in 1949 in the wake of an anti-trust action, after which the Comerford was re-named the Paramount Theater. It was shuttered and threatened with demolition in the seventies, until S.TO.P. ("Save the Old Paramount"), a local boosters organization headed by businessman F. M. Kirby, II, came to the rescue. The theater was placed on the National Register of Historic Places in 1980, rehabilitated, and is now the F. M. Kirby Center for the Performing Arts. Its not that great - it falls apart midway, around the point when Lamarr appears. Stinky will leave them, thank you.